Finally, on March 5, Major League Baseball signed a lease for a new ballpark, agreeing to the city’s $611 million cap. MLB also agreed to contribute $20 million toward the cost of the stadium, although it did not agree to cover stadium overruns. Further, MLB added the condition that excess ballpark tax revenue earmarked for debt service for the bonds be available for cost overruns. Two days later, on March 7 the DC City Council, by a vote of 9–4, approved a construction contract for a state-of-the-art stadium with a contemporary glass-and-stone facade, seats for 41,000 fans and a view of the U.S. Capitol, and affirmed its demand that public spending on the project be limited to $611 million. The votes were the final actions needed to satisfy the terms of the deal struck in September 2004, paving the way for the sale of the team. Nationals Park is a baseball park located along the Anacostia River in the Navy Yard neighborhood of Washington, D.C. 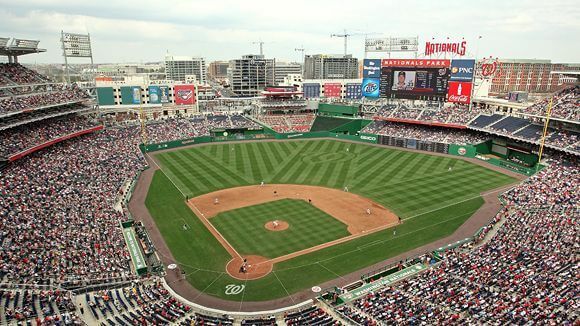 It is the home ballpark for the Washington Nationals, the city’s Major League Baseball franchise. When the Nationals franchise relocated to Washington, D.C., they temporarily played at RFK Stadium until Nationals Park was completed. It is the first LEED-certified green major professional sports stadium in the United States. The facility hosted the 2008 season’s first game (in North America), when the Nationals hosted the Atlanta Braves on March 30, 2008.